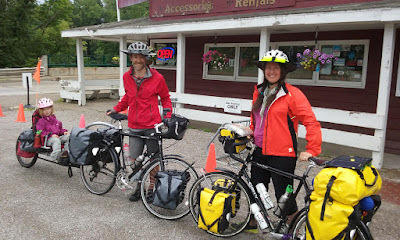 Century Cycles Blog: Bike touring is fun for the whole family! Bicycle touring is something that the whole family can enjoy! For proof, look no further than Theresa and Robert, who left their home in Brooklyn, New York on their Surly Long Haul Truckers with their 4-year-old daughter Zoe in tow on a Weehoo trail-a-bike! They stopped by the Century Cycles store in Peninsula yesterday. They were hoping to eventually reach California by the end of the summer, but were making a little slower pace than expected, so hope to reach Minnesota before school starts in September. You can see more photos of long-distance touring cyclists who have visited all three of our stores in our Bicycle Touring Photo Gallery.